May 20, 2014 - Frank Draney, Human Resources Director, and Ken Relei, Recruiter, recently represented Union Wireless at a leadership event sponsored by the Uinta County Business Leadership Network at the Roundhouse in Evanston, WY. The MentorABILITY organization, directed by Wanda Rogers, reaches out to the youth of Uinta County to provide them meaningful leadership and career development experiences with potential Uinta County employers. 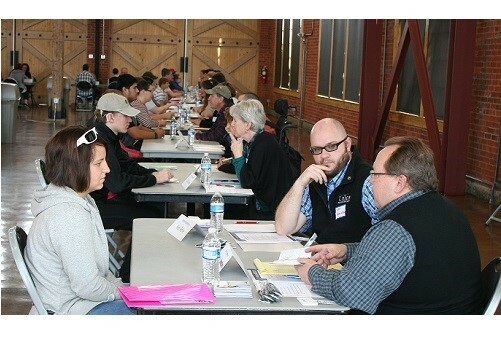 This year’s event included more than 20 interview stations lined up along the inside walls of the Roundhouse with multiple employers from Uinta County represented at each station. The students progressed to a new employer’s station every 6 minutes, where they answered interview questions and received feedback regarding their interview skills. The students did a great job and exhibited a unique blend of professionalism and honesty as they “sped” through their interviews.